Have Lofty Ideals . . . Converted Warehouse Buildings, Open Ductwork and Beams, Large Industrial Windows, Concrete Floors . . . All visions that are conjured up when you think of an Urban Loft. Unfortunately, for most of us, thinking about Loft Living was about all we could do. After all, weren’t Lofts just for Hippie Artists and Musicians (Beatniks for those of us a little older)? However, most of that is old news. Today, Lofts are a viable alternative to those with even the most conservative and mainstream lifestyles. The imagination and creativity demanded to transform a stark cold former factory or warehouse into a warm, inviting home is a the real dream come true. 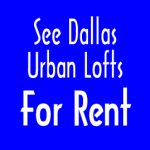 While a number of Lofts are located in Deep Ellum or The Cedars neighborhoods, there are also several properties in both Uptown, Downtown, and The Design District which all have that unique quality that only an Urban Loft can offer. 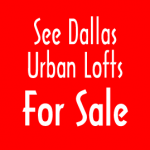 Intown has a wide variety of Urban Lofts, For Sale and For Rent, in many neighborhoods of Dallas; and across a wide spectrum of style, size, and price. If you are tired of the same old rut, and are ready to try a break-out lifestyle; an Urban Loft might just be your answer. Check out the Listings below to preview some of Dallas’ most desirable Urban Lofts; and then call an Intown Associate to see first hand.